The presence of the invasive North American signal crayfish has been confirmed in a loch which drains into the River Nith in southern Scotland. The find has provoked serious concerns about their potentially damaging impact on the environment and angling. The Nith Catchment Fishery Trust verified the presence of the crayfish in the waters of Lochrutton. It is also investigating reports of the species being found in the River Nith near the Kingholm Quay. Survey work is now being carried out elsewhere in the lower reaches of the estuary. A plan is also being formulated to prevent any further spread of the non-native crayfish. The NCFT is working with Scottish Natural Heritage, the environmental watchdog Sepa, and Marine Scotland to develop a strategy. Eradication is said to be impossible in such a large body of water as the River Nith. Instead, the focus will be on educating the public on how to stop the species establishing itself in new areas. Signal crayfish can be accidentally spread by using equipment, such as angling nets and boats, which have previously been used in water containing the creatures. It is illegal to trap or move the fish and any caught accidentally must be killed on site. The NCFT plans to set up signs highlighting the threat to the biosecurity of the river. Golden eagle: The shot bird was found by a member of the public. The Scottish SPCA was alerted on Saturday after a member of the public discovered the injured bird in north-east Dumfries and Galloway, adjacent to the Southern Upland Way. The golden eagle is now receiving veterinary treatment and specialist care at the charity’s National Wildlife Rescue Centre. “This eagle has been caused tremendous pain and suffering. It became grounded after being shot, which caused the feathers on its tail and wings to break and meant it was unable to search for food. “If the eagle hadn’t been found on Saturday it is very likely it would have starved to death. Golden eagles are extremely rare and it is very concerning that someone would deliberately try to injure or kill such a magnificent creature. “As well as being cruel, injuring a wild bird is also a criminal offence under the Wildlife & Countryside Act 1981 and we are very keen to speak to anyone who has information about this incident. This eagle will require lengthy rehabilitation and expert treatment in our care. “With one golden eagle already found poisoned this year, and a second bird the apparent victim of an illegal trap, this is yet another appalling incident. Whoever pulled the trigger must have deliberately targeted one of our most iconic birds, with lethal intentions. The Scottish SPCA Animal Helpline is 03000 999 999. THREE of Scotland’s biggest supermarket chains have banned Scottish mackerel from shop shelves. Sainsbury’s, Marks & Spencer and The Co-Op say they will not buy the fish while its environmental certification has been suspended. The suspension follows a dispute with Iceland and Faroe Islands who breached mackerel fishing quotas in the northeast Atlantic. Overfishing by the two countries meant quotas were exceeded by 25% in the past two years. Mackerel fishing is worth £160million a year to the Scottish economy. As a result the Marine Stewardship Council (MSC) which certifies that fishing is sustainable, suspended certification of the entire mackerel fishery. By far the country’s most valuable catch, Scottish fisherman landed around 146,000 tonnes of Mackerel, worth £163million, last year. The industry is worth £160million a year to Scotland’s economy. Fishing industry experts said they would be “extremely disappointed” if supermarkets abandoned selling Scottish mackerel. Marks & Spencer said it would not buy Scottish mackerel unless it was certified by the MSC. Tesco, Aldi, Waitrose and Morrisons said they had no plans to stop selling Scottish mackerel. Labour Shadow environment secretary, Claire Baker, said supermarket confusion was unfair on consumers. Fisheries Secretary, Richard Lochhead, said he did not need a lecture on how to talk to supermarkets. “I have personally raised my concerns over their sourcing of seafood on many occasions. Ian Gatt, the chief executive of the Scottish Pelagic Fishermen’s Association, said it would be unfair to penalise Scottish fishing boats for a problem they did not cause. “I’d be extremely disappointed if consumers in Scotland can’t buy Scottish mackerel. A gamekeeper left a buzzard to starve to death after it was caught in a trap used legally for trapping crows. Jonathan Graham, 30, of Foss, was supposed to have dismantled the trap on the Glenlyon Estate, near Pitlochry, Perth Sheriff Court heard. After the buzzard got trapped, Graham did not open the cage door wide enough to allow the bird to escape. He admitted to failing to inspect the trap every 24 hours as he was obliged to do, leading to the bird’s death. Graham was banned from using trap cages for five years and fined £450. RSPB Scotland has welcomed the conviction. When the buzzard became trapped, Graham used a bucket to keep the cage door ajar rather than remove it completely as he should have done, the court heard. Fiscal depute Shona McJannett told the court that gamekeepers could use the licensed cages, but had to carry out checks on them every 24 hours at least. She said: “In Scotland, all wild birds enjoy a high degree of protection from the law. 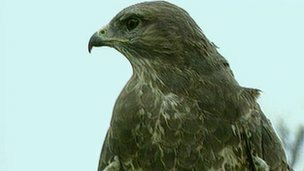 Tayside Police were called to the estate by a walker and found the decomposing remains of a buzzard within the cage on 27 February last year. Solicitor David McKie, defending, said Graham should have removed the cage door. He said a fine would mean his client would be “rendered almost unemployable” as a gamekeeper because he would not be able to operate a licence to control wild birds. Sheriff Robert McCreadie said case involved “a dereliction of the duty owed to all wild birds”. Two divers have been taken to hospital after being rescued by a search party in the Firth of Forth. Forth coastguard was called at about 17:30 BST by a diving group who feared the two men had failed to resurface. A helicopter from RAF Boulmer in Northumberland and four lifeboats from Dunbar, Anstruther and North Berwick went to the scene. The two divers were taken to North Berwick by helicopter and transferred to hospital by ambulance. The coastguard said because of the weather conditions it would have been difficult for the group to have spotted the men if they had resurfaced in a different location from their fellow divers. A coastguard spokesman said:“The area the divers were lost in was so vast that we needed as many people searching as possible. 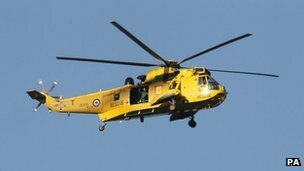 “Thankfully the men were spotted by a Dunbar lifeboat around 6.20pm and a paramedic dropped down from RAF Boulmer to treat them. The group had been diving near Bass Rock in the Forth. James Bond could be set to boost Scottish tourism after a highland glen featured in the first trailer for the new film SKYFALL. 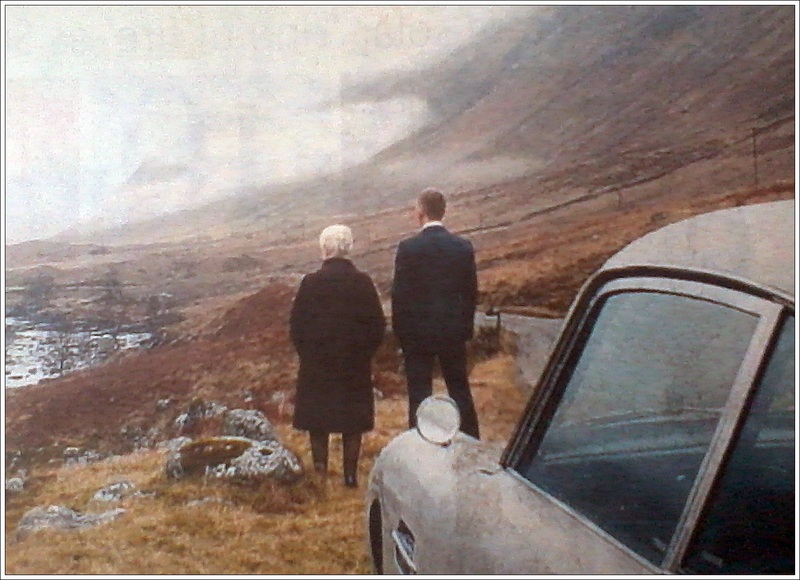 Daniel Craig, who plays 007, and Dame Judi Dench, who returns as boss M, can be seen looking into Glen Etive while standing next to an Aston Martin DB5. Nearby Dalness Lodge, not seen in the clip, was owned by the family of Bond’s creator Ian Flemming and is thought to feature as a safe house in the movie. The production also shot scenes near the White Corries in Glencoe. Scotland has been used as a location for two previous Bond films, The Spy Who Loved Me and The World Is Not Enough. Skyfall, the 23rd official Bond film, will be released in cinemas in October.